On Dec. 5, 2015, John Benham received the KSBA 2015 Beekeeper of the Year award. John is a longtime beekeeper, past president of KSBA, and a friend to beekeepers across the state. He frequently mentors new beekeepers and is always willing to share his knowledge with others. John is also an active member of several local beekeeping associations. Reasons for his nomination included his dedication and service to KSBA, his unselfish willingness to help so many beginning beekeepers, and his expertise as a beekeeper. Congratulations, John! 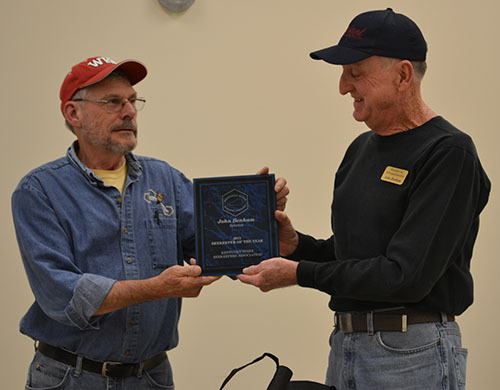 Joe Taylor (left) presented the 2015 Beekeeper of the Year Award to John Benham (right) at the KSBA fall meeting.